If you decide to create a Login Account with us, we will ask for certain information in order to establish and maintain your online account. Additionally, you will have the opportunity to determine which information (address, phone number, etc) gets published on your website or gallery page. Any information you request to have published to your website/page is done so at your own risk. Signing up for our services is entirely voluntary. We do not sell any personal information to any third parties. 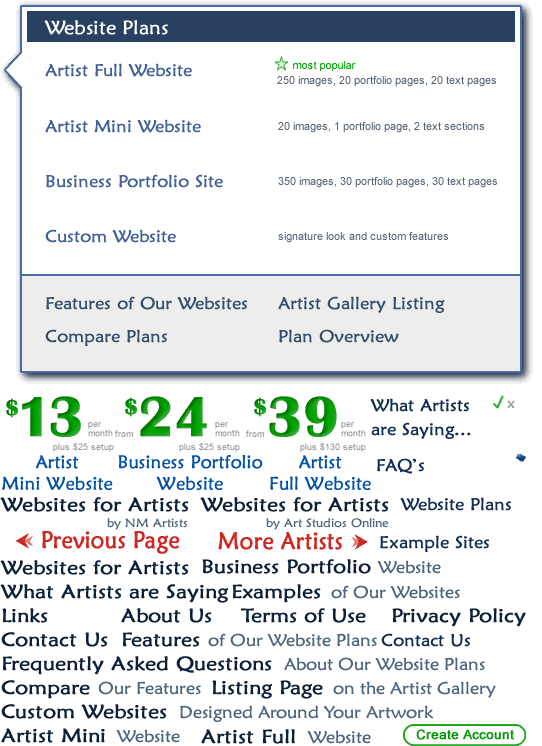 NM Artists/Art Studios Online may use software plug-ins from or have links to third party websites or companies. Lucht Studios, LLC does not have any control over and is not responsible for the Privacy Policies of these entities. In the case of government/law enforcement or other third parties, we may need to disclose personal information when required by law (for example, pursuant to a statutory demand, subpoena, warrant or court order), to protect against fraudulent, abusive or unlawful use of the NM Artists/Art Studios Online website, to protect our rights or property, to enforce any contract between you and Lucht Studios, LLC, or if we reasonably believe that a situation involving danger of death or injury to any person requires disclosure. This website is not targeted at persons under the age of thirteen (13). Individuals under the age of eighteen (18) should seek parental consent. Persons under the age of eighteen (18) may not register or create a Login account. We keep and store email and other correspondence for the purpose of billing, answering inquiries, and to help us improve our programs and customer service. We may also occasionally contact registered users via email, phone or mail in regards to our services, about this Site, about any user account you may create, about fulfillment of a specific transaction you have requested, or about other significant developments that may affect your use of the Site. You cannot opt-out of this kind of correspondence.